Blog title, this blog was named after a long research and was selected from several other options. I wrote down several words related to crooked and amongst them this was the selected one. I had already decided that it would include the word Thought for sure. Crooked mainly because I think a lot,I mean a lot. My thoughts range from something acceptable to what the…? So I chose the word crooked.This was the place where I could write mostly what I wanted to and let the world read it without being judged.I have a lot to say,one day I’d write a poem and post photographs and then on some other day I would be writing a short story and then I’ll be offline for a few and on coming back you might get to read a social topic and how I want to solve a particular problem.You see it has no pattern,this blog has none of it.It means a lot to me although in the starting I often wondered if this was the right title or if it sounded right?But it has slowly become my identity and I like it. Someone amongst you would surely wonder how in the world could a mind be crooked? But c’mon it is not actually crooked but the way it thinks and wanders to strange places makes it crooked. In the end it is the title of this blog. 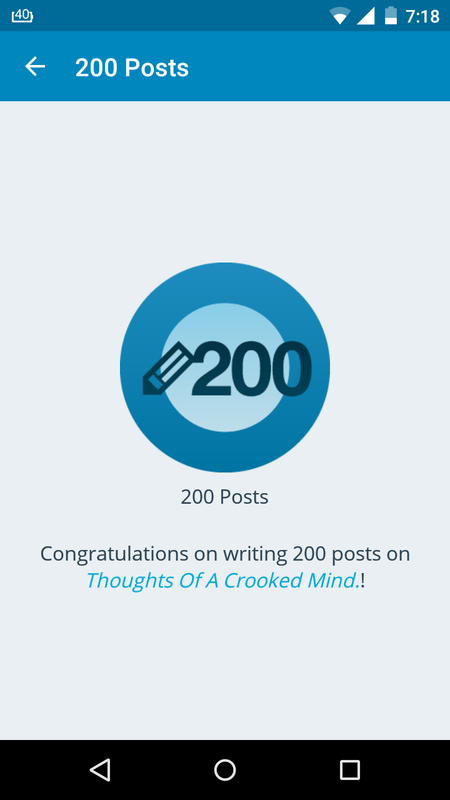 Something that would be worth mentioning here is this is my 200th post on this blog and I’ve been blogging for almost 11 months(started 23 July, 2014).Never imagined I’d do good here.Thank you. Previous Post Trees – Photo post. haha! crooked – I can relate to that!